The apartment in renting in Saranda is next to the sea. Every time I look out the window I can see the island of Corfu. That’s one the things I’ll miss most about living here. The other thing I will miss is watching the sunset over the sea. I’ve got into the habit of sitting on the balcony at sunset and staring out to sea. As the sun drops closer to the sea the sky changes colour from orange to red and the whole evening spectacle is reflected on the rippling water. I like to watch the sky change colour above Corfu as well. If I’ve ever taken the time to watch the sunset over the sea in other countries I can’t remember doing it. 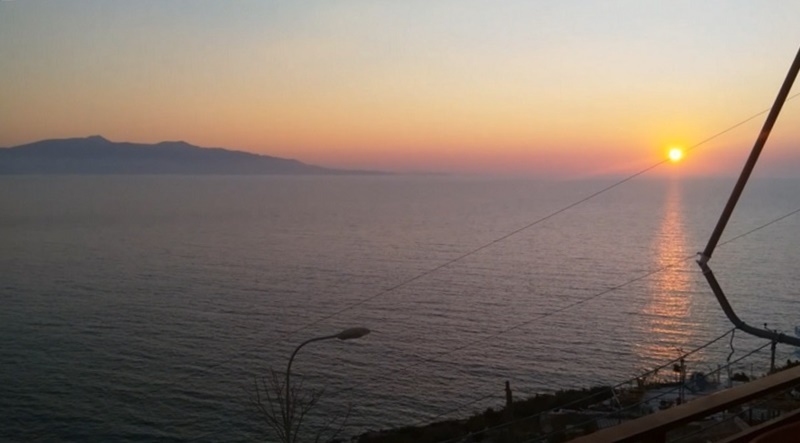 Watching the sunset over the sea at Saranda is an experience I will never forget. When I was a child growing up in North Yorkshire, I often watched the sun go down. It was a long time ago but I can remember experiencing some very fiery-red sunsets. When I got older and had to take on more responsibility life became more hectic and I stopped taking the time to watch the sun going down. Here in Saranda, in an apartment like this, it’s hard to avoid seeing the colour in the sky. When I do, it makes me want to see more. That’s how I ended up spending so many evenings sitting on the balcony. Today is my last day in Saranda and my last chance to watch the sunset over the sea. Tomorrow, I’m handing back the keys to the apartment and taking the bus to Tirana. Living in this apartment for a month has been a learning experience. My life is no longer hectic. It hasn’t been for a number of years and I have very few responsibilities. I think I should take more time to enjoy simple pleasures like watching the sun going down. Everyone should. Life is a gift and it’s far too precious to waste. Most of us have to work to live, but we don’t have to live to work. When was the last time you took the time to watch the sun going down? Previous Article Previous Article: Does Rolling Clothes Really Save Space When Packing? You Bet!